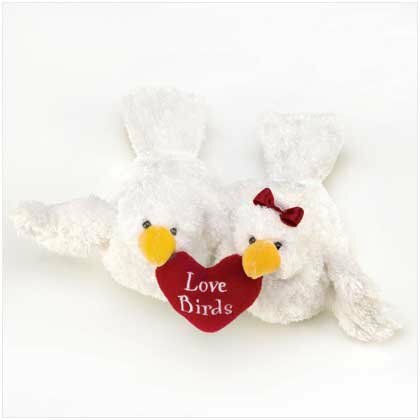 Treat your sweetie to this huggable twosome of lovestruck birdies! So soft and cuddly, these lovable little love birds are a light hearted declaration of your everlasting affection. GANZ plush. Weight 0.2 lb. 9" x 7" x 4" high. Polyester fabric. /!\ WARNING: CHOKING HAZARD - Small parts. Not for children under 3 years. Adorable and cuddly plush love birds. Made from soft polyester fabric in lovely white finish. Wonderful décor item for any girl's bedroom. Warm and lighthearted gift to express affection. Lovely gift idea for valentine's day and birthdays.